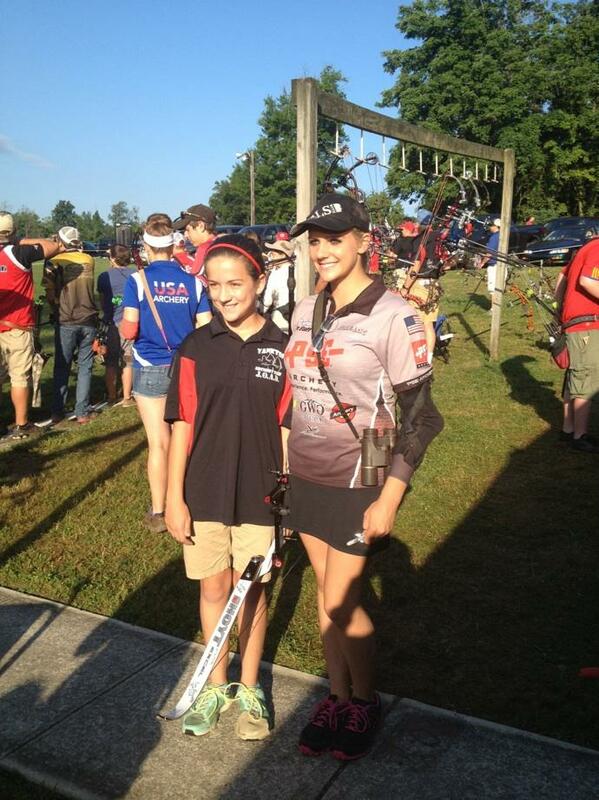 When I first went into the National Outdoor Tournament, I was a little nervous but I was feeling good. The first day I shot I was supposed to be with all of my competitors, or even just a few, but one person in my group did not go to the right course so me and the girl that was there had to be split into two groups. I went with other friends that were from the same group but they weren’t competitors of mine. When I got about halfway on the course, I had an equipment failure. I was standing my bow up with an arrow and started to walk away and my bow fell over as if it wasn’t propped up completely (which is probably what happened). Well, when I picked my bow up off the other bow hit into it, my string flipped around and I began to panic. I went to the official tent nearby and told them what happened but they were not helpful because they didn’t have anything like it before and didn’t know what to do. Thankfully a group next to us was shooting recurves so they had bow stringers and I could put it back on the right way. I was really thankful. After that incident I checked everything I needed, shot some practice arrows and all was good. The second day was fun as well. When I shot the 2nd day, I shot with my competition from the archery facility and another person I shot with before so it was fun to shoot with her again. The third day was the award ceremony day! It was also the day where one of my competitors had to leave the course because she was already done shooting all 3 days and thought she could shoot another day. She was very confused and so was our group so we had to get an official. When we got it straightened out, the air horns sounded on the course for the last day! When they blew, that we meant we shoot and we were ready. After we got done we were tired, sore and ready to go to the ceremony but that wasn’t presented for another TWO MORE HOURS of waiting. We mostly just sat around hanging out and waiting. When it was finally time for the awards name by name, category by category and then finally my name and category. I was waiting thinking I had gotten 3rd place because I didn’t do as well as I could have because I kept having weird things with my equipment but not me, I GOT SECOND PLACE…IT WAS ME THEY CALLED!!!! I was so glad I got 2nd place and was grateful for it. The lesson I learned in the tournament is always carrying my tools and USE them. When my coach went to tune my bow afterwards, it turned out there were several things that should have been caught and could have been corrected. Now I know! Everything is a learning experience and this was no different!